To celebrate spring (and have an excuse to day drink), my roommate and I hosted a grand “indoor picnic” party. We made a bunch of appetizers and gallons of refreshing cocktails. We even purchased this nifty plastic beverage dispenser so we could easily transport our bar up to the roof at the first sign of sunshine! Anyway, during our mixologist debut, we made tons of homemade Pimm’s Cup and these amazingly refreshing vodka mangosteen drinks, but we totally forgot to use the mint! Allrecipes.com is always my first stop when I’m trying to figure out ways to utilize the random stuff in my fridge before they go bad – you can enter what ingredients you want and don’t want, and the site generates all the recipes from that match your specifications. It’s awesome. 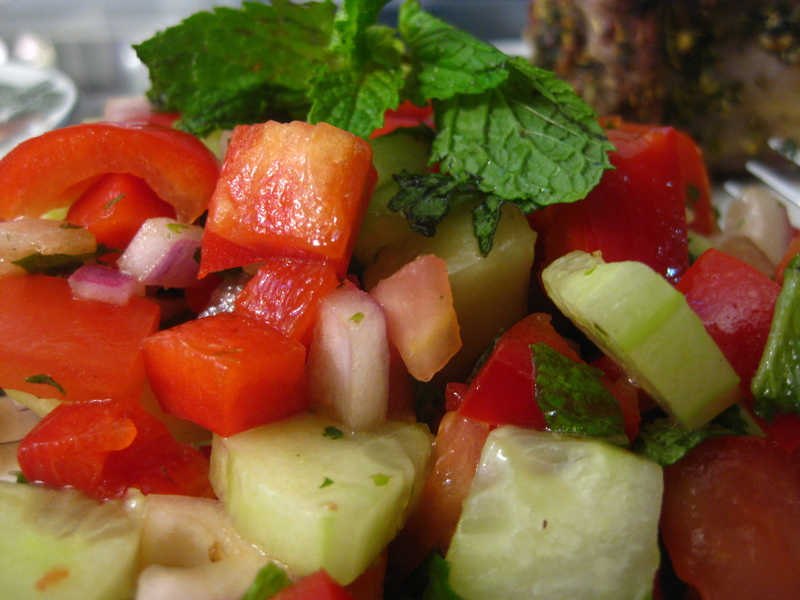 So I found a recipe called Tomato, Cucumber, Red Onion Salad with Mint. Pretty self-explanatory. Actually, I threw in some red bell peppers as well, so technically it’s Tomato, Cucumber, Red Onion, Red Bell Pepper Salad with Mint… but let’s not get crazy here. Very simple, refreshing salad. Just the way I like it! I love making random Greek salads or essentially bruschetta without the bread… just drizzle some olive oil, balsamic, red wine vinegar (or my new love – champagne citrus vinegar! ), salt and pepper, and I can’t resist a sprinkle of Italian seasoning. 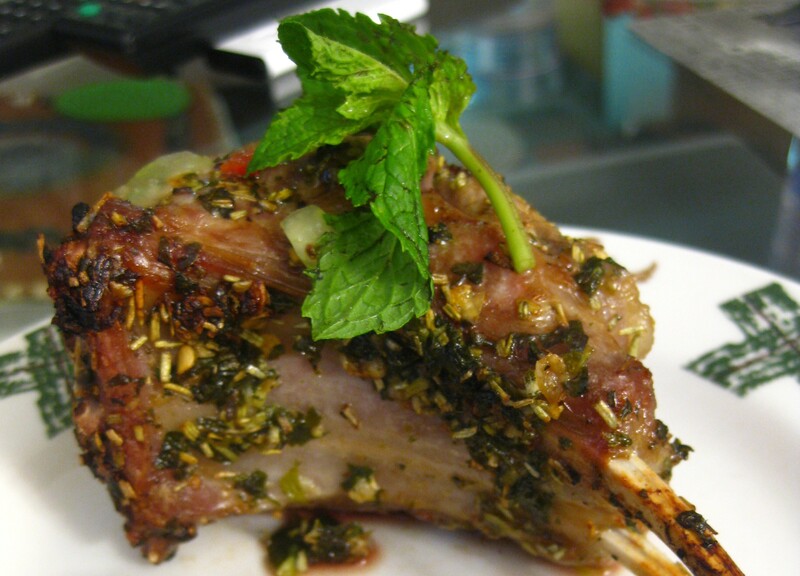 My more ambitious project with mint was inspired by Rachael Ray, whom I saw making a spring supper with broiled lamb chops. But while searching for this recipe, I ended up getting distracted by another Food Network minty lamb recipe by Emeril Lagasse and opted to cook it instead… sorry Rachael! Place the lamb chops in a baking dish (or giant Ziploc bag like I always do when marinating). In a bowl combine the oil, garlic, rosemary, mint, lemon juice, Essence, salt, and pepper. Pour the marinade over the chops and turn well to coat on both sides. Let sit at room temperature for 30 minutes, or refrigerate, covered for up to 4 hours. Place the diced cucumber in a fine mesh sieve set over a bowl. Lightly salt and let drain for 1 hour. Pat dry with paper towels and place in a clean bowl. Add the remaining ingredients and toss to combine. Cover and refrigerate for 1 hour and up to 4 hours before serving. Stir well before serving. 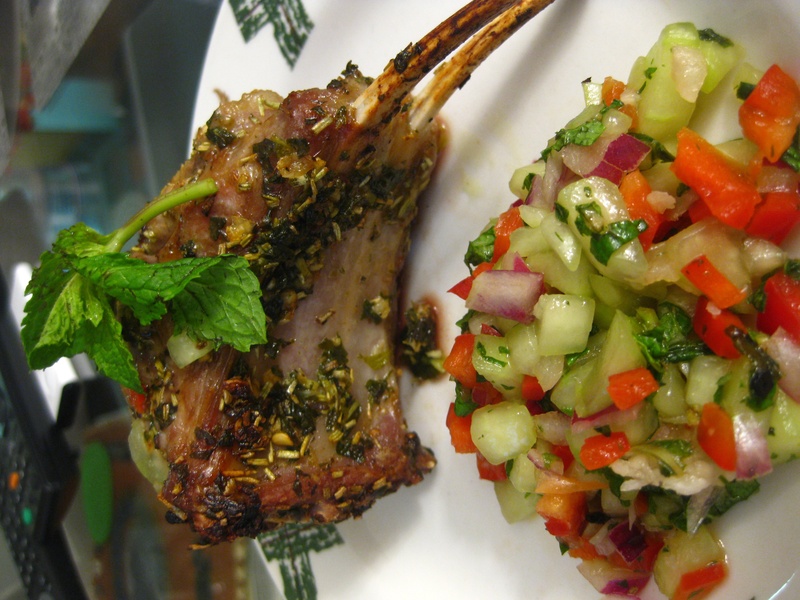 I’ve never made lamb chops in my life – and I was so happy with how these turned out! Very easy to make- I made the marinade and chopped the cucumbers which took about 15 minutes… went down to the gym for an hour while letting the lamb chop marinate and the cucumbers dry, then another 20 minutes of cooking- everything was done! The salad and the relish obviously overlapped in tastes, next time will only do one of these and maybe make some garlic dill mashed potatoes… yum!